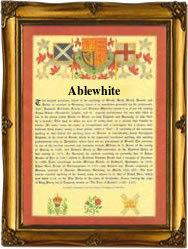 ecorded in many forms including Applewhaite, Applethwaite, Applewhite, and the dialctals Ablewhite and Abblewhite, this is an English surname. It is locational from either of the places called Applethwaite in the counties of Cumberland and Westmoreland. There is also an unproven suggestion that the name may originate from a now 'lost' medieval village in the county of Suffolk, because of the preponderance of the name recordings in that county. The name means the place where apples are grown from the Olde English pre 7th century 'appel-peit'. The similar villages and surnames of Apperley, Appleby, Applegarth, Appleton, and Appleyard, are evidence of the important roll of the humble apple in the life and very survival of people in ancient times. Locational surnames were usually 'from' names. That is to say names given to people after they left their original home, to move somewhere else. In so doing they took or where given as easy identification, the name of their former village. Spelling over the centuries being at best indifferent, and local dialects very thick, soon lead to the development of 'sounds 'like' spellings. In this case early examples of the recordings from the county of Suffolk include Stephen Appletheit in the Subsidy Tax rolls of 1327, George Appelwhite in the Hearth Tax Rolls of 1524, and Henry Ablewhite, in the Hearth Tax register of 1797.